It’s been a few years since I got to roll out pretzels, so I was really hoping this mix would be the same dough I was familiar with from when I worked at Auntie Anne’s back in high school. Sorry I don’t have any photos of the contents of the baking mix. It was early morning and I was so pumped to make these that I completely forgot to take photos of everything for the blog. All I could think of was getting the dough prepared before lunch. Only remembered after they came out of the oven. Contents included dough flour, yeast, baking soda, salt and cinnamon sugar, plus an instruction sheet. 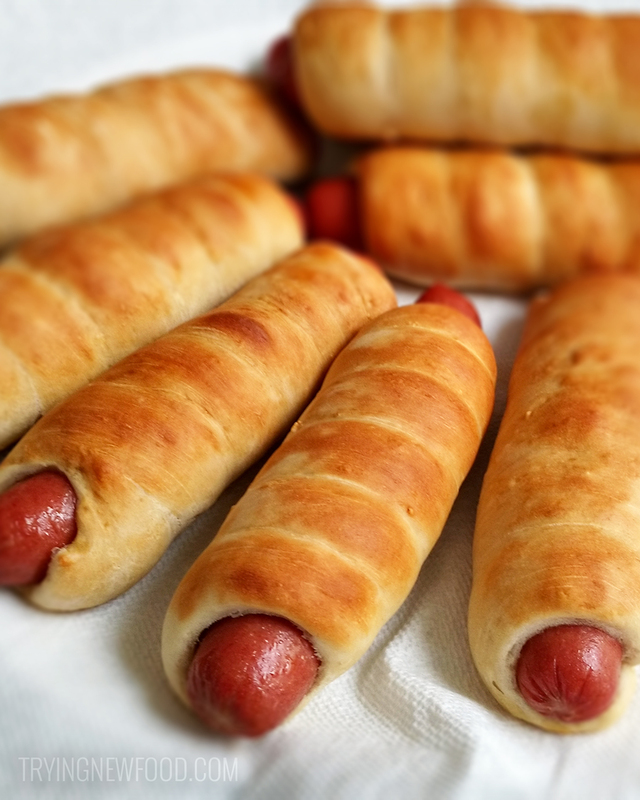 Not included, but used to make these: hot water, hot dogs, some extra flour, non-stick spray, cling wrap, silicone baking mat, and cookie sheets. For the dough, I added lukewarm water to the yeast and waited for 2 minutes. Then I mixed it into the dough flour and kneaded everything together for a few minutes. Had to sprinkled some extra flour on it since it was pretty sticky. Then I sprayed a large bowl with non-stick spray and put the ball of dough in the bowl. I also sprayed cling wrap with non-stick spray, covered the dough and put it on top of the oven while it preheated. I had assistance from my husband with preparing the hot water needed for the baking soda and hot dogs. He heated up 4 cups of water to put the hot dogs in for a few minutes, then 4 more for the baking soda. 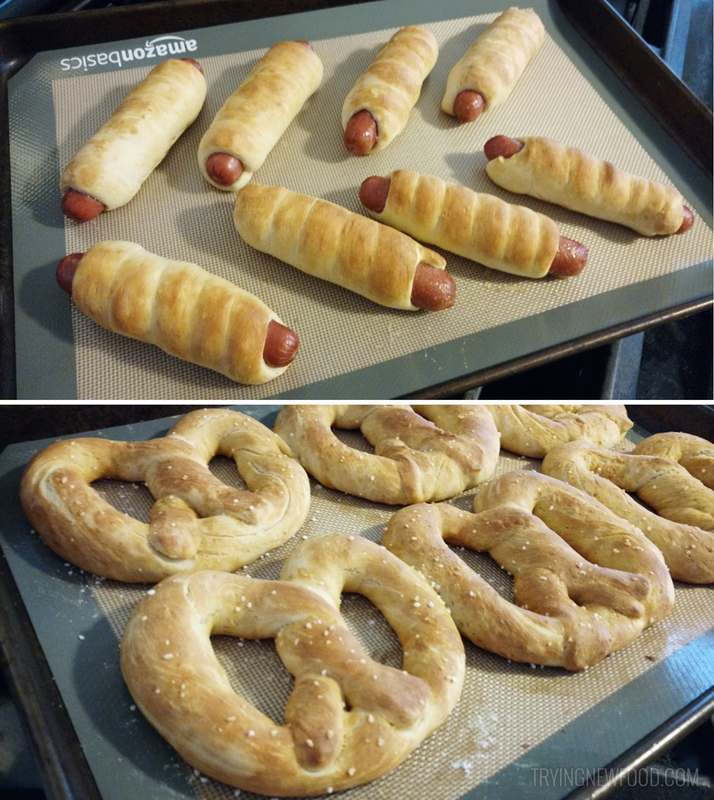 After rolling pretzels and pretzel dogs, I dipped them all in the baking soda water and put them on silicone baking mats (referral link to the ones I bought below). If you don’t have these baking mats, spraying the trays with non-stick spray should be okay. These mats made it easy to remove them after baking and made for quick cleanup. The dough took 30 minutes to rise, and baking time was 5 minutes, then a 180° tray turn, then baked for another 5 minutes. I think our prep took probably 20 minutes total. So everything took around an hour. There was the option to brush them with melted butter when they were done baking, but we skipped that step to reduce the calorie count. Everything turned out great, and I will definitely be buying this kit again the next time I miss rolling pretzels! The dough was JUST like the kind I remember from back then, except a lot less than the giant dough amounts we used to prepared at once. I was surprised at how many pretzels and pretzel dogs this Auntie Anne’s Pretzels & More Homemade Baking Mix made! I got 6 pretzels and 8 pretzel dogs out of it. 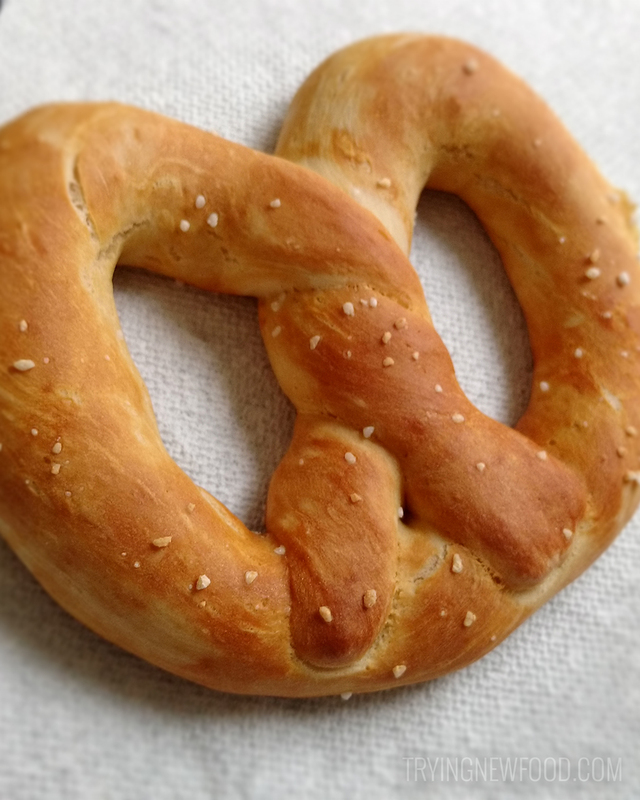 We made original pretzels, but you could also make cinnamon sugar pretzels as well. Other options you could make are pretzel sticks, pretzel bits, or you can check out this page to see even more recipe ideas. To store leftovers, I put them in Ziploc bags with a paper towel and keep them in the fridge. These look amazing, and much more cost effective than buying pretz for lunch!!!!!! Thanks for the comment! Those pretzels and especially the pretzel dogs are so pricey now at the mall.